Most of the information I needed came from this excellent article at tinyapps.org, but there are various other aspects to the setup that I have subsequently discovered and are worth sharing. Having followed the instructions in the linked article, I could connect to my VPN from both my MacBook Pro and iPhone, but the MBP couldn’t see the home Mac’s drives. There are a few steps I had to take to make this work. Most domestic routers assign IP addresses in the 192.168.0.x or 192.168.1.x ranges. I setup my router to use a different subnet, 192.168.200.x, so that there will be no crossover between what the local router is serving up for IP addresses and what the iVPN is serving. In iVPN’s address range field I then chose 192.168.200.50 – 192.168.200.60. 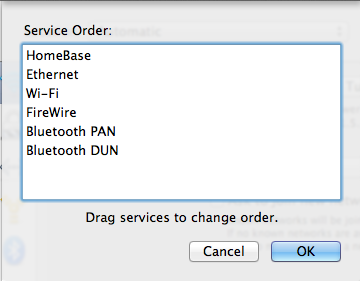 I have also set the router to assign the home Mac a reserved IP address, so that it’s always the same. Here, HomeBase is what I’ve called my VPN connection. Then in the following window, drag your VPN connection to the top. 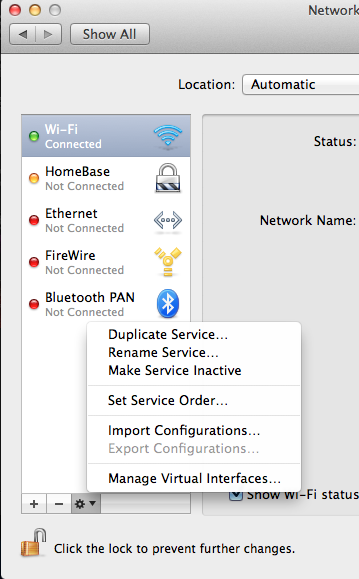 Now when connected to my VPN, in the Finder I can use command-K to connect to server, and type in my home Mac’s IP address on the home network. This is always the same as I have told the router to reserve it. My home Mac is at 192.168.200.4, so in the Connect To Server box, I type in afp://192.168.200.4. I am then prompted to log in as if I was at home. I have found that the VPN service doesn’t play well with uPNP on the router. I have disabled uPNP, and set up manual port forwarding rules for all services on the network. I was going to write a post about Lion, but @smithsocksimon’s already written what I was going to say much better than I would have. Some Lion impressions. Just read an interesting post by Shadoe Huard – 7 months Flashless – about, well, not using Flash for 7 months. I’ve been doing the same for some time, and it’s transformed my browsing experience. As an iPhone addict, I’m used to having Flash content denied to me; however I’m also used to having alternatives provided to me. iPhone content developers are increasingly using HTML5 to provide iOS-accessible content, and this is coming to the desktop too. I’ve not gone to the extreme of completely removing Flash, but I have employed workarounds. The greatest is ClickToFlash. 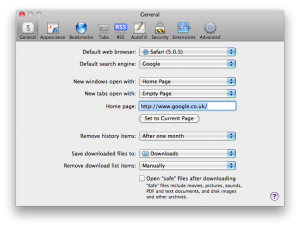 This excellent Safari plugin disables Flash content, replacing it with a box notifying you that there is Flash content. You can then click on the box to enable the Flash content, should you wish. The benefits are tangible – pages load faster, and the fans on the MacBook don’t whir up to 10000000 rpm!. There are a few sites out there that are still sadly heavily Flash reliant. I’m a Liverpool fan, so I visit liverpoolfc.tv every day. This site unfortunately uses a great deal of Flash navigation. The good thing is that ClickToFlash offers the option automatically to enable Flash content on a site-by-site basis. This means that the site displays as it is meant to without me having manually to enable the content on every visit. YouTube is of course another Flash-based site. ClickToFlash however blocks the Flash video and serves up the HTML5 video that they provide anyway for iOS devices. The result is much lower processor overheads for watching web video. Not just YouTube – Vimeo is also served up as HTML5. Probably the most insidious usage of Flash however is advertising. A combination of ClickToFlash and the methods outlined in my recent post about ad-blocking mean that you can view websites in peace. A problem with Flash is that hovering the mouse over a Flash ad normally doesn’t show where the link goes to, so it can be difficult to find the server to add to my block list. Techniques have also been developed to obfuscate the link in the source code, so just blocking the Flash full stop does the trick. A few weeks ago there was a great hullabaloo about the first large-ish scale trojan to hit Mac OS X. MAC Defender and its variants were heralded as the first in a wave of threats against the Mac platform, and proof that we Mac users were about to be knocked from our smug high horses. Well, let’s get this into perspective. OS X is now nearly 10 years old, and this is the first instance of a piece of malware running wild. And the thing is, it’s entirely avoidable (as are many Windows infestations) by using simple common sense. Here’s a picture of a MAC Defender window. This scary looking window relies purely on social engineering to make you accept its warnings. It looks like an official window, but is it? Look closely. 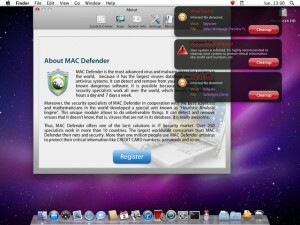 Firstly, there’s its name – MAC Defender. Macs are Macs, not MACS. Why the capitalisation? Then read the text. It is littered with grammatical errors and non-sensical sentences – “The largest worldwide companies trust MAC Defender their nets and security”, for example. Does this look like the work of an official product, or a bunch of scammers? Then consider the ultimate purpose of the application – to harvest credit card numbers by making you buy their product (amusingly the window pictured shows the words “credit card” capitalised, as the creators of this trojan promise to protect you from exactly what they’re up to). Simple common sense dictates that you do not ever type your credit card information into something that has appeared on screen unbidden. You can protect yourself more though. A glaring flaw in the Mac’s security has always been Apple’s decision to allow downloads to open automatically. This is what has allowed this malware to infect people – visit an infected page, or click an infected link, and not only does the malware download but is able to open. You can protect yourself by turning this option off in Safari. Make sure that the last option “Open safe files after downloading” is unchecked. Now whatever is downloaded to your machine, by choice or by not, will remain in your downloads folder until you choose to open it. If in doubt about where something came from, don’t open it. Simple common sense.